My journey towards blindness began in October 2001 when I had my first Central Retinal Vein Occlusion I became Legally Blind in 2010 after a series of Central Retinal vein Occlusions in my left eye. I have come to the conclusion lately that I am coming to a new period of my life. There was my childhood, my teenage years, adult single life etc. Then a couple of weeks ago there was the day I died. Of course you are not now reading the words of a "Ghost" writer. I am back again at my keyboard typing today as I am in a hard work type of mode. Dictating to Dragon Naturally Speaking is for my slower days. Anyway. Three weeks ago, today was in fact the day I died. I had gone to the doctors a couple of days before and complained of a pain in my left side. I had a cough and was not surprised to have him say that I had probably strained a muscle in my ribs coughing too hard. I had pulled one of those muscles many years ago in a car accident, the seat belt held me so tight it pulled one of the rib muscles. I concurred the pain was about the same. He did not send me home however, this was cause to delay and send me to hospital. Two days of tests showed nothing wrong. Thumbs up for the pulled muscle diagnosis I thought. Then just one procedure to do. There I was all wired up to a heart monitor and a nurse prepared my arm for a new I.V. drip for the duration of the procedure. I recall her saying "Just a prick." I answered "OK, but I feel faint." Next thing I recall was the room was full of about twenty people, shouting and calling to me and each other. Some people called on me to look at them, and I remember getting irritated with them saying, "I am blind. I can't really see you." Anyway. My mutterings gained a rapid quieting in the room. As people began to settle down and move out slowly. What had happened? Not long after the nurse had heard me say I felt faint, my heart had stopped beating for over thirty seconds. It had then started and stopped again over the next several minutes. Finally continuing to beat strongly. For several minutes I had hung between life and death. There were no mystic revelations. Just quiet peace. Most worrying was it was all too easy to just die. Way too easy. 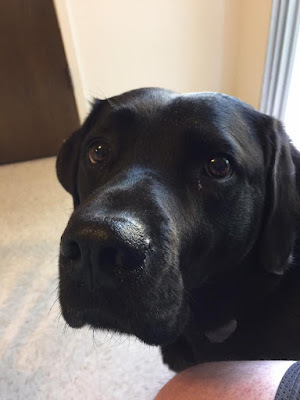 Follow William's board Black Labrador Retriever on Pinterest. Guide Dogs For the Blind Home Visit. US Citizenship Class ends in Smiles. William Elliott 2011. Simple theme. Powered by Blogger.